Meet Fallon, our Christmas puppy. And by “our” I mean my mom has to take care of her while I get to walk and walk and walk her on weekends. 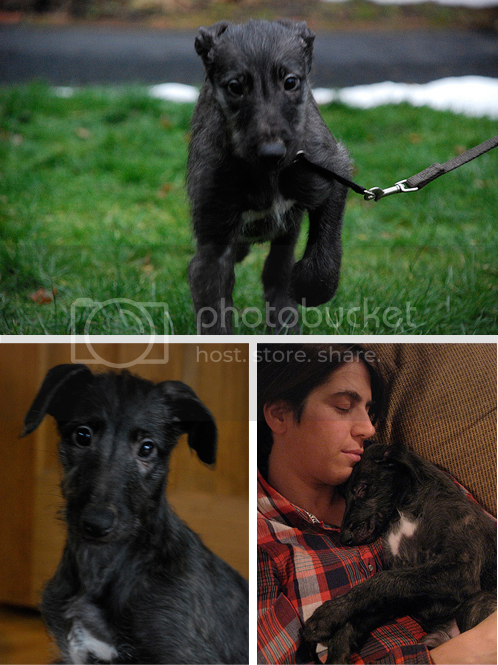 A nine week old Scottish Deerhound -- currently a lapdog, soon to the size of a small pony. More pictures, because she's cute as a button, here. I love Scottish Deerhounds:) Noble and leggy! Cute as a button hardly describes her! Cutest thing ever would be better! Will she all legs full-grown? Congrats! She looks like one happy pyppy! Aaah, she's so sweet! I see you have a greyhound, too - are they getting along well? Fallon has sort of a greyhound-ish look to her that I've never noticed in deerhounds before. Thank you, all! She is a sweetheart. Sadly, he'll be twice as big the next time I see her. Cacodaemonia -- they are very similar, although she'll be a lot bigger -- taller and slightly heavier build. They also have a similar personality -- very calm. They love to run, but only in short sprints. Then it's nap time.